How are civilians killed in Syria? The measures and modes of civilian killing in Syria differ from most other conflicts. Specifically, direct civilian killing seems relatively uncommon at 2.4% of all recorded events, compared to 25-40% in a typical African conflict. What explains this? Two factors are responsible: the availability of advanced technology and frequent remote violence in Syria including air strikes, long-range artillery, and drones allow fighting forces to intimidate and kill civilians from afar (see trend line). In these ‘remote’ attacks either armed groups are targeted with civilians as collateral or civilians are purposely targeted. Further, civilian killing in Syria is most commonly part of indiscriminate rather than targeted/selective killing of civilians. Indiscriminate violence is more common when there is little territorial control  and more contest or when government seeks to separate the civilian support base of insurgents through indiscriminate violence. Indeed, both conditions often hold in Syria (see visual) and both conditions are mutually reinforcing: advanced technology leads to indiscriminate civilian killing while indiscriminate civilian killing is aide by indiscriminate technology. 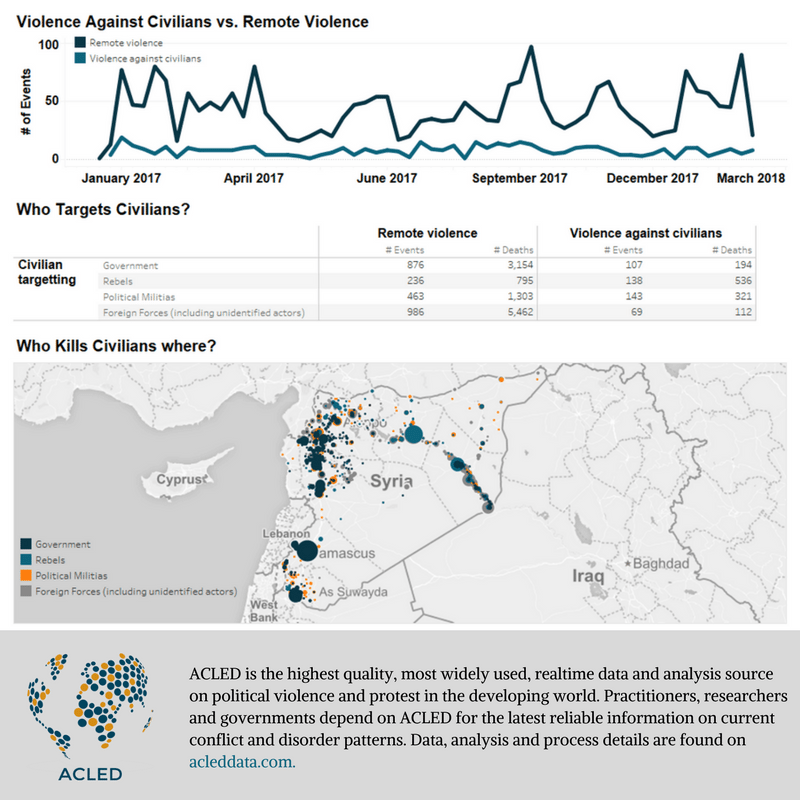 As a result, many of the killing of civilians in Syria are not captured as ‘Violence Against Civilians’ but as ´Remote Violence´ in ACLED data. Needless to say, that all this comes with an important disclaimer: there is absolutely no clarity on the exact number of people killed in Syria and we do not claim to be correct. Counting deaths is a highly complex endeavor requiring sustained research efforts and specialized methods to make credibly distinctions between combatant and civilian, account for reporting patterns and make reasonable assumptions about cases that are similar. Hence, at best our information on fatalities gives users a way to understand the means by which civilians are killed. But fatality data is highly suspect even in the best of cases. Kalyvas, Stathis N. 2006. The Logic of Violence in Civil War. Cambridge ; Cambridge University Press.